As most of you know by know, I’m quite the fan of food and learning about religion. That’s why when Christian History Magazine emailed me about their latest issue I was pretty intrigued and wanted to share it with you. 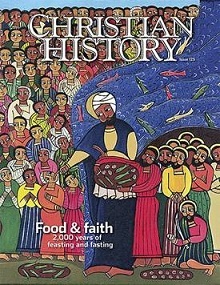 The issue is “Faith & Food, 2000 Years of Feasting and Fasting”. This issue is packed with tid-bits of information about foods mentioned in the Bible and Christianity’s holiest meal, the Lord’s Supper. Many more meals and meal traditions have been documented, among them: potlucks and fellowship meals, soup kitchens and church gardens, Christian cookbooks and Christian diets, the temperance movement, feasting, fasting and practices of hospitality. What should Christians cook?, Faith in the kitchen by Jennifer Trafton – Jennifer Trafton, author, artist, creative writing teacher, and former managing editor of Christian History. The royal way, Feasting or fasting? the constant Christian tension in the public square by Kathleen Mulhern, who teaches Christian formation and church history at Denver Seminary. Fasting: from the Orthodox front lines, we should consider the spiritual discipline of not eating by Frederica Mathewes-Green, author of Welcome to the Orthodox Church and numerous other books, and frequent essayist and public speaker. Everyday substances, heavenly gifts, From the beginning, the holiest Christian meal used everyday food by Andrew McGowan – J. L. Caldwell McFaddin and Rosine B. McFaddin Professor of Anglican Studies and Pastoral Theology and dean of Berkeley Divinity School at Yale. He is the author of Ancient Christian Worship and Ascetic Eucharists. Eating (and not eating) with the church fathers, Things church fathers said about food compiled by Jennifer Woodruff Tait – Managing editor, Christian History. Raise a juice box to the temperance movement, Getting unfermented wine from the vineyard by Jennifer Woodruff Tait – Managing editor, Christian History. What would Jesus buy?, How nineteenth-century Christians transformed our grocery aisles by Matt Forster – freelance author living in Clarkston, Michigan, and a frequent contributor to Christian History. The sacred duty, a Seventh-day Adventist menu by LaVonne Neff – freelance author and blogger at LivelyDust, raised an Adventist. From Cana to Jell-O, Christian fellowship meals: feeding the hungry and each other by Barton E. Price – director of the Centers for Academic Success and Achievement at Indiana University–Purdue University Ft. Wayne and teaches history, music, and religious studies. Welcoming the Stranger, Serving the guest—including with bread by Carmen Acevedo Butcher – lecturer at the University of California at Berkeley and the author of Man of Blessing: A Life of St. Benedict. I haven’t read the entire issue yet, but I’ve read a few articles so far and I find it interesting. The articles are well written and the art is beautiful. Are you interested? Well good news, you can read it for free online at the Christian History Institute’s website! And if you like what you read, you can subscribe with a donation of any amount you choose.